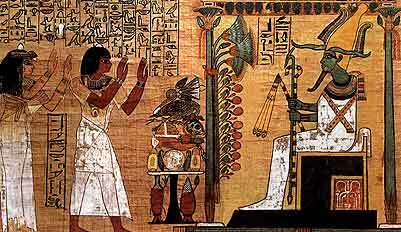 Kha was responsible for building projects not just in the reign of Amenhotep II, but also in the reign of 3 or 4 kings: Tuthmosis III, Amenhotep II, Tuthmosis IV and Amenhotep III. One of the few noble tombs to have survived intact down through the centuries - it was discovered by Arthur Weigall and Ernesto Schiaparelli (the discoverers had 250 workers digging for weeks in pursuit of the tomb). 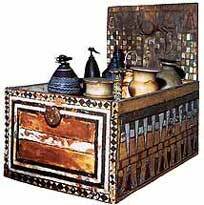 The tomb held the funerary equipment of Kha and his wife Meryet - the items found in the tomb shows the couple certainly to have been quite wealthy during their lifetime. Unlike the chaotic burial of Tutankhamun, the burial here was very carefully laid out, the more important items had been covered by dust sheets, and the floor had been swept when the last person had left. Kha had been buried in a rectangular and two nested coffins, his mummy had been tightly wrapped with several items of jewellery included within the wrappings. 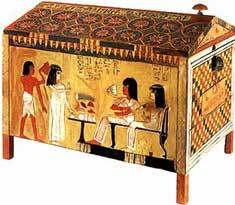 Also included in one of his coffins is one of the earliest examples of the Book of the Dead. 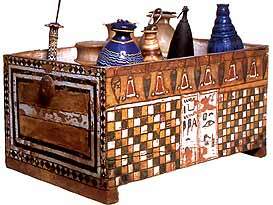 Meryet was buried in a rectangular outer coffin with one inner anthropoid coffin and a cartonnage mask. Her mummy was loosely wrapped with funerary jewellery.